Laptop stands for DJs are sturdy and convenient devices that can securely hold laptops, iPads and tablets during performance. 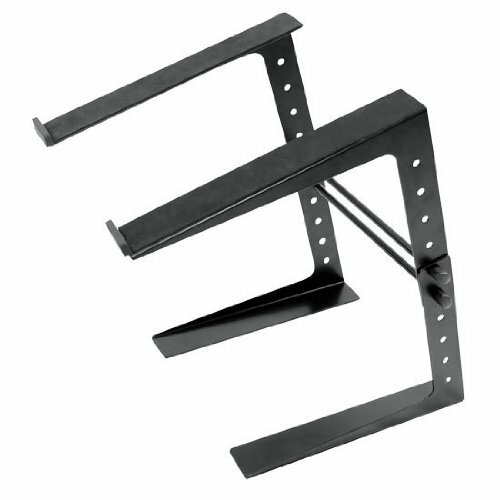 They can come in a variety of configurations from double shelf to dual arm to folding to portable & adjustable. If you are a disc jockey and you need a stand, take a look at some of the portable DJ stands that we have selected below- they are highly rated, affordable and available for online purchase. What sort of music do DJs play? What do DJs actually do? What is a disc jockey career like? If you need a durable laptop stand, this easy-to-assemble product is a good choice. Aside from holding laptops, it is also compatible for CD players, controllers, and EFX machines. With a maximum weight capacity of up to 8 pounds, this stand can be installed on any flat surface. It can also be easily adjusted in four different heights. However, many users find its lowest height of 6.5 inches still a bit too high. This sturdy laptop stand has an open construction, allowing for enhanced air circulation. Overall, it is a strong product for its price. This lightweight adjustable stand does not just work for laptops but also for projectors, controllers, tablets and other devices with comparable weight. It is a great space-saver- helping you declutter your performance area. Among its important features include aluminum knob, carbon steel tubing and lever lock assembly. It also has a bright coat finish. The maximum elevation of this stand is about 13 inches. 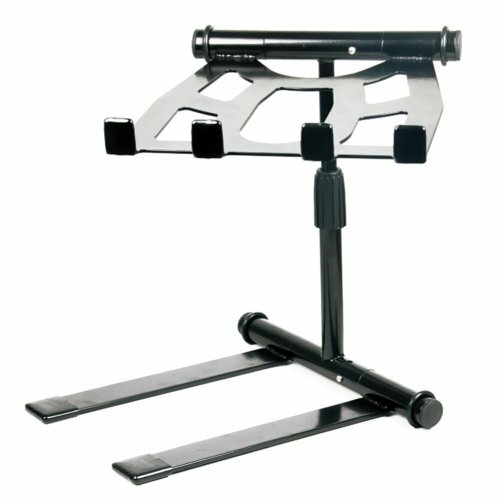 When you buy this stand, it comes with a nylon carry bag and a one-year limited warranty. For some buyers, they complained that the stand is a bit uneven for some reason. This stand has received solid support from its user base, specifically because of its versatility. It can be installed on a tabletop or clamped to a wall, table and other vertical structure. It is sturdy and can be adjusted to a maximum height of 11.5 inches and a minimum height of 6.75 inches. 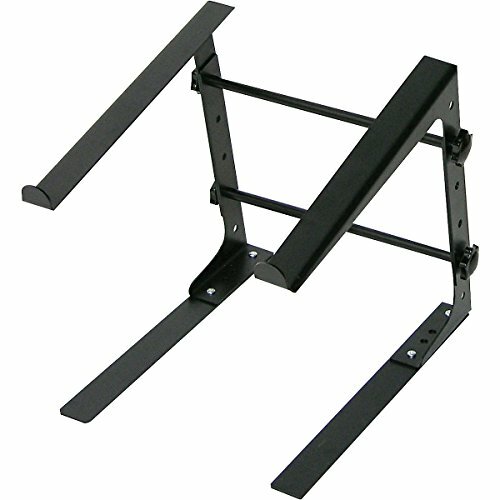 This stand has long support arms which can hold gear with a width of 9 inches or larger. Its overall measurement is 12 x 15.5 x 14.5 inches and weighs about 6 pounds. While its braces are made of metal, it comes with foam stickers that you could adhere to avoid scratching your computer. One issue, some users did note, is that the stand can be a bit wobbly. As a versatile stand, this Gearlux model is ideal for DJs, lighting designers and musicians. It can hold a laptop that has a maximum width of 17 inches. It is also compatible for controllers, printers and mixers. You can use it as a stand-alone structure or you could also clamp it to a table or a desk. Four height options have maximum and minimum measurements of 14.17 and 9.25 inches, respectively. This product is also fitted with padded grips on its two 11-inch arms for extra stability. With a bevvy of satisfied buyers, there is no doubt that this product is worth its value. It has four prong anti-slip trays that can securely hold your laptop even in demanding environments. The shelf dimension measures 8.6 x 9 inches while its telescoping height can be adjusted from 12.6 to 16.7 inches. 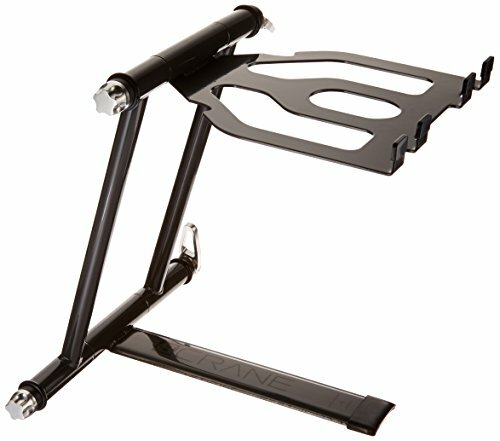 The foldable parts allow you to conveniently bring this stand on trips. 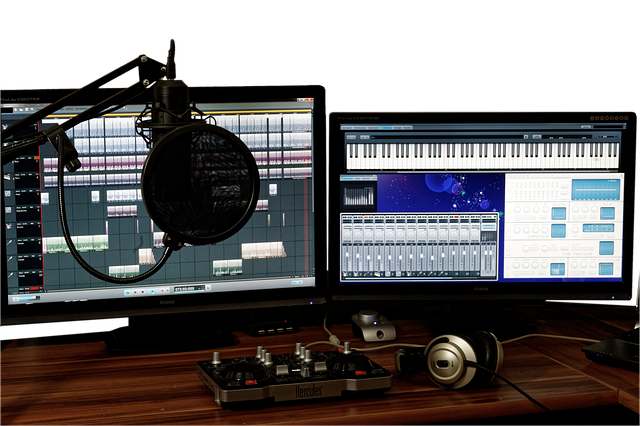 It is compatible not just with laptops but also with turntables, keyboards, mixers and other equipment. Many users say that it could have been a perfect stand if its angle can be adjusted not preset. Disc jockeys are people who play music recordings. 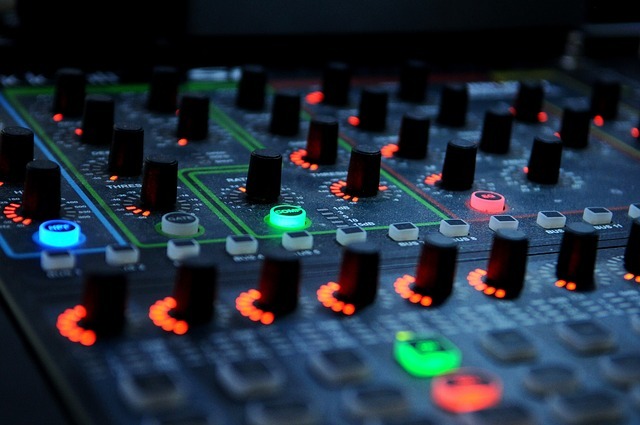 Typically a DJ will work in a variety of different venues, from large stadiums to more intimate banquet halls. 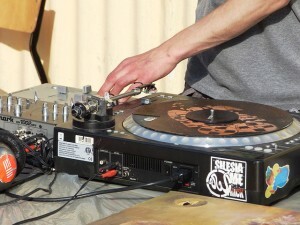 The role of a DJ may vary, as well, depending on what is required of them and the audience that they are performing for. Many DJs began working at radio stations. At a radio station, they will typically select music from a playlist that has been preapproved by station management. The playlist is designed to appeal to a target demographic that is the audience for that particular station. jockeys have come to rely on modern technology, and particularly their laptops, it’s important to have a laptop stand that enables them to comfortably access all of their music files when they are performing for an audience. Disc jockeys will typically play music such as classic rock, adult contemporary, hip-hop, rhythm and blues, jazz, country and western, and electronic music. When a DJ plays at a wedding reception, which is very common, they typically the couple that is getting married will supply the music they they wish to have played the reception. Where DJs play, they typically try to get the crowd involved and stimulated, which usually means getting people to dance as well as matching the tone and mood of their music to the occasion. Make people wonder whether the DJ nowadays is simply pressing the play button on the iPod. While it is true The DJ could simply press play and then do nothing else, we are actually responsible for managing effect music is having on their audience. Hey DJ his laptop laptop stand are all tools in an arsenal intended to keep people dancing. A quality DJ will have a pre-assemble playlist that they will blend into one continuous song. If the songs all ended and there is a gap between the end of one in the beginning of the next, it would break the rhythm that people on the dance floor are responding to. 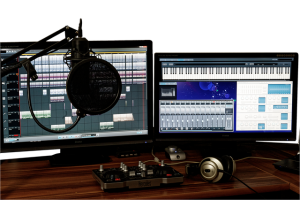 Really creative DJs will be able to integrate different tracks and interesting and unexpected ways to create original compositions. as well as many other DJ terms. *Check out this helpful webpage to read up on some DJ terms and definitions. If you are in the market for a DJ laptop stand, you may already be a professional this jockey. Or, perhaps, you are merely performing as a hobby. If you speak to a professional this jockey, but they will likely tell you is that one of the best parts of the profession is that it allows you to be highly creative. If you work on the radio, you won’t just be playing music. 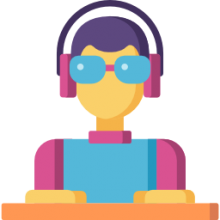 You will have to deliver the news, discussed the weather, chat with other cohosts and even speak and interview celebrities or people who call in to the show. You also have to be first in a variety of different types of music. Besides that, you also have to be pretty organized To keep a live show running flawlessly. When some DJs were surveyed, the biggest drawback that they mentioned was the experience of isolation. Oddly enough, many DJs don’t actually socialize with that many people while they are working. While it may seem that they are the life of the party, whether they are working in a radio station or performing in front of a large audience, they’re actually performing by themselves and this can be pretty isolating. Be aware of this potential drawback. If you’re going to try and begin a career as a disc jockey, you should be aware that you’ll have to pay your dues. A lot of DJs have to work a small local market for a long time before they break into the big leagues. It’s essential that you cultivate a clear speaking voice, a vibrant personality, some technical understanding of how station operations work, as well as an understanding of music while you work your way up. If you’re just trying to break into clubs and other performance venues- it may make sense to upload your mixes to YouTube and begin marketing them. You can build out a YouTube channel, build a following, and leverage that for paid gigs. With online fame will come the opportunity for in-person performance. This is when it would make sense to ensure that you have a DJ laptop stand so that you will not be caught short when your opportunity comes.